In the first post about our visit to the Museum of Oddities at the Cazenovia Library, I talked about the architecture of the Greek Revival building, and of the really weird things we discovered in its little museum. By far, the weirdest thing we saw was the Egyptian mummy. And its mummified cat. The mummy was obtained by library patrician Robert J Hubbard, who traveled to Egypt in 1894. He came back with a variety of strange and ancient artifacts specifically for this museum. 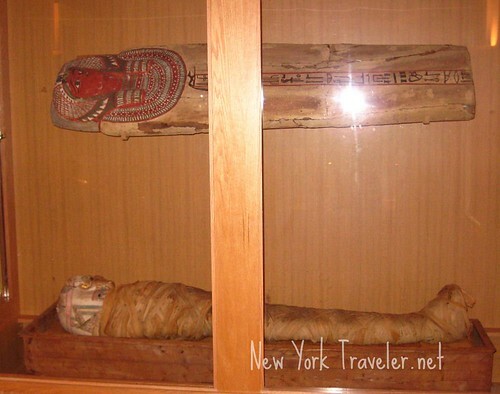 The mummy is called the Cazenovia Mummy and is believed to be 2110 years old (the person who is now mummified is determined to have lived about 104 B.C.). The information was a little confusing. There was plenty of documentation and books about the mummy, but there was no place to sit down and read it all. 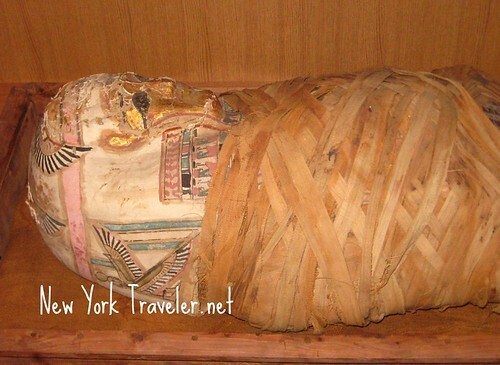 From what I could gather, there were TWO mummies brought to Cazenovia, but one of them deteriorated. The mummy we saw was well-preserved, and was estimated to be a 30-50 year-old female. You can click on the pictures and then click “ALL SIZES” for a large enough view to read the pages of the book. Lots of tests were done on the mummy. 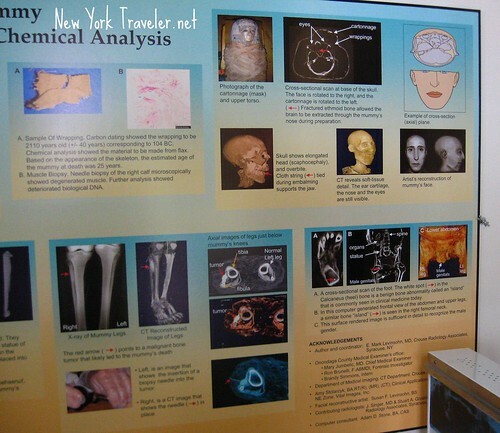 The DNA of the person is too deteriorated, but experts were able to come up with a loose idea of what the person must have looked like. A CAT Scan and X-ray were done of the mummy too. There was a huge chart of all the results. And guess what? 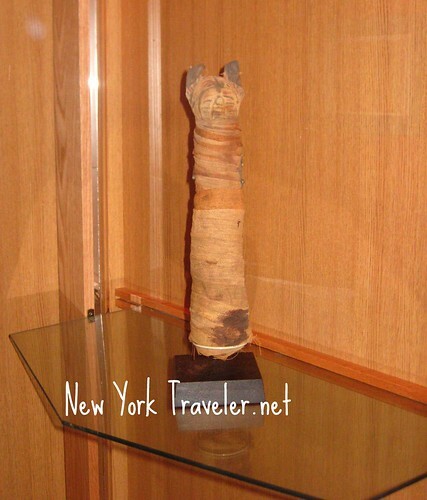 The mummy came to New York with her pet cat! It was a great visit and the Museum of Oddities certainly lived up to its name! Luxor– ROFL!! What is it with such wonderful cats? They are witty, sassy, friendly, and fun! I love your blog, Luxor! Thanks for your comment. I’ve really been enjoying your blogs, too! 🙂 Thank you! Hello Mrs. Mecomber! My name is Alyssa and I’m the Assistant Director of the Cazenovia Public Library. Everyone here is very pleased that you enjoyed your visit. Hen, the mummy, is a big part of our small library. Up until the time when the CT scan was done, we thought that he was a she! The scan revealed that Hen was a male, and about 25 years old. Sadly, he died of a malignant bone tumor. 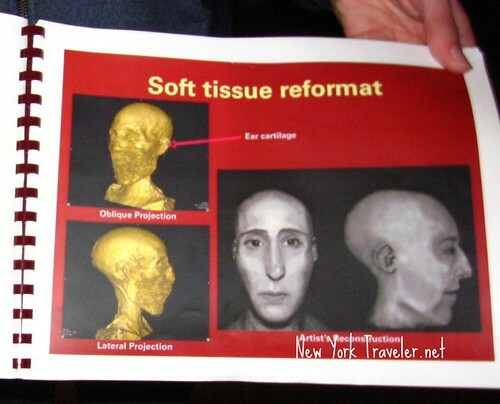 The mummy book compares what we thought before the scan with what we found out. You are correct in stating that there were two mummies. It is believed that Mr. Hubbard purchased two, and had one unwrapped before bringing it back to Cazenovia. 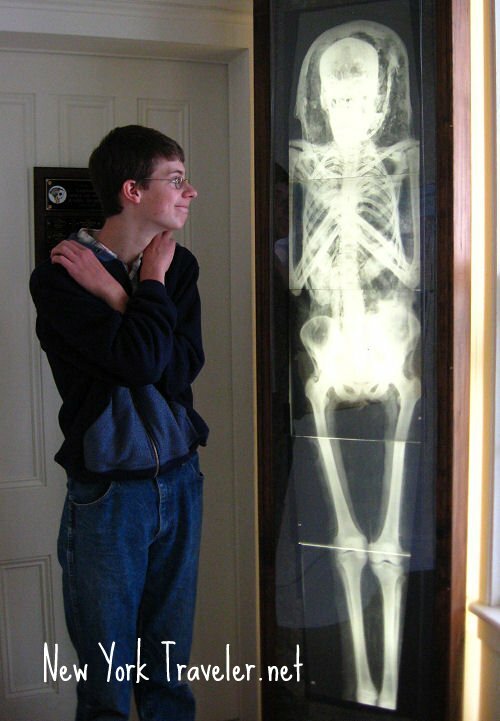 This mummy was in such poor condition that all that is left is a skull, which is on display in the museum. We hope you’ll come back to our library soon, because the museum is undergoing some exciting improvements. We are adding a “Digital Information Gateway,” full of information on Hen, Mr. Hubbard, and the artifacts in the museum. Thank You Mrs. Mecomber! Hi Alyssa! It’s great knowing that you guys from the library read my post. And thanks for clearing up some of the details about Hen. I really appreciate it! I hope we get the chance to visit again. Until then, God bless!